SEATTLE – For Seahawks fans, it will be 12 days of high anxiety. For Seahawks administration, it’s an item that shoots to the top of their already crowded “to-do” list, leap-frogging ahead of “prepare for draft.” Or, at the very least, it tests their ability to multitask. The news that Wilson has slapped an April 15 deadline on his contract negotiations, a story broken Tuesday, adds an element of suspense and intrigue to an already existing conundrum. 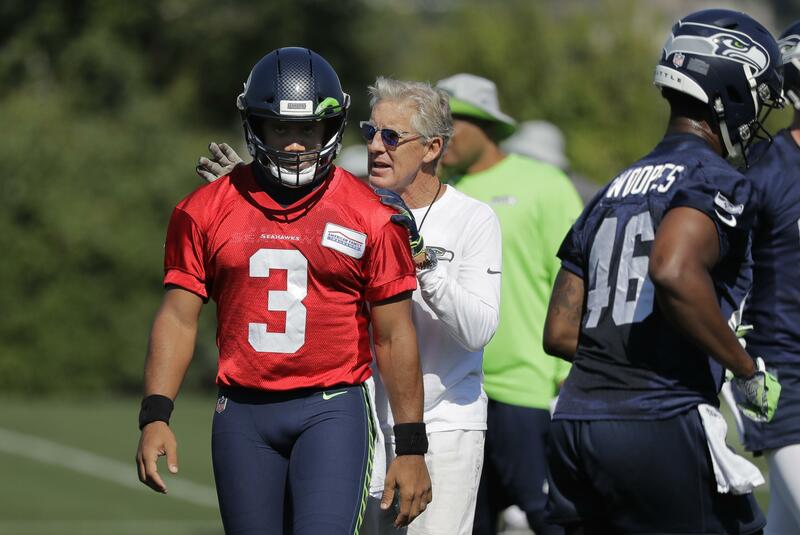 To review: The Seahawks can’t let their franchise quarterback get away. But paying Wilson may compromise their ability to build a championship-caliber team around him. Oh, and Frank Clark also wants a piece of that finite pie, as do Bobby Wagner and Jarran Reed, who also possess contracts that are about to come due. By the way, a few free agents at positions of need would be great, too. That’s the puzzle that John Schneider and Pete Carroll have spent the last few months trying to put together. The rules, and the degree of difficulty, haven’t changed. But now, there’s suddenly a deadline looming less than two weeks away. If the Seahawks were planning to put Wilson’s contract on the back-burner while they proceeded with other matters – such is their time-tested way of doing offseason business – those plans will have to change. This can be a good thing. Nothing promotes deal-making more than a deadline. Just look at the Bryce Harper negotiations meandering into the middle of spring training to see how the absence of a drop-dead date can curtail a sense of urgency. Or it can be a bad thing. If somehow the deadline passes without a deal, it would be disruptive for a franchise that has devoted considerable effort to restoring the feeling of tranquility and togetherness that had waned in recent years. No one knows exactly what Wilson would do if no contract agreement is reached by April 15. He doesn’t seem like the holdout kind. It’s hard to envision him doing anything but preparing diligently for the upcoming season. He’s already said he’s prepared to play 2019 without a contract. But it certainly has the potential for awkwardness, if not animosity. And it will ensure that Wilson’s contract remains the prime topic of conversation, with all the attendant distractions that coaches detest. To a certain extent, the Seahawks hold the upper hand here. Wilson is already under contract for the 2019 season, and Seattle has the ability to keep him for 2020 and 2021 by virtue of the franchise tag. They don’t necessarily have the same motivation as Wilson to fast-track these talks, especially with all that other stuff to deal with. But Wilson holds a chip that may trump that line of thinking. The last thing the Seahawks want is a disgruntled quarterback going into a season in which the team harbors championship aspirations. Especially one as central to their success as Wilson. Neither side wants it to come to franchise tags, even though Wilson could net one-year deals that exceed $30 million a year. What he wants most is a long-term deal with a high – perhaps record – guarantee, rather than year-to-year uncertainty. And the Seahawks don’t want the massive salary-cap hits that comes with franchise-tagging an elite quarterback. Put all that together, and I see a deal getting done by the deadline. There might be points along the way where it seems hopeless – negotiations of this magnitude usually do – and there might be hints of rancor (ditto). But with the mutual motivation for a resolution that exists, they can get where they need to be by Tax Day, despite the complicated navigation it will take. By all accounts, the sides have been engaged in talks in recent days, which is a positive step, regardless of a reported lack of progress. No need to let this meander and fester through the minicamps and OTAs. It doesn’t seem likely that anything will change the market in the next four months. Whatever the Seahawks’ ultimate offer would have been in July, before training camp – which is when Wilson signed his last extension – it can presumably be offered now. Get Wilson off their plate, and the Seahawks can deal with the pressing Clark negotiations with a better knowledge of their financial landscape. They prefer not to take the $17 million cap hit that would come with the franchise tag Clark is holding, and they’d also prefer not to deal with the fallout of any unhappiness Clark is harboring over not having a long-term deal. That’s the next deadline to heed: July 15 to reach a deal with Clark. But right now, the Seahawks are all about April 15. Grab the popcorn. Published: April 4, 2019, 2:45 p.m. Updated: April 4, 2019, 8:22 p.m.